This uncommon surname is a patronymic form of the medieval male given name "Hankin", itself a diminutive of "Han(n)", an aphaeretic form of Johann. Johann, the usual German form of John, derives ultimately from the Hebrew "Jochanaan", "Jehovah has favoured me (with a son)" or "may Jehovah favour (this child)", and was adopted into Latin (via the Greek) as "Johannes". "Hankynus" (without surname) was recorded in the 1285 "Cartulary of Oseney Abbey", Oxfordshire, and a Hanekyn de London was noted in the Calendar of Letter Books, Cambridgeshire, dated 1300. An entry in the Household Book of Queen Isabelle, dated 1358, refers to "Hanekin Almond, varlet of the Countess of Surrey". Early examples of the surname from this popular diminutive personal name include: Hugh Hankyn (Cambridgeshire, 1327), and Alexander Henekyng (Somerset, 1330). The earliest recorded patronymic form of the name is Alice Hankynes (Colchester, Essex, 1337), the final "s" being a reduced form of "son of". On May 18th 1594, Nicholas Hankinson and Elizabeth More were married in London. The noted poet Thomas Edwards Hankinson (1805 - 1843), mentioned in the "Dictionary of National Biography", won the Seatonian prize at Cambridge nine times. His poems were collected in 1844. 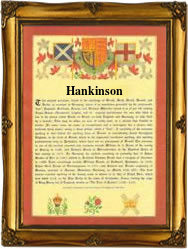 A Coat of Arms granted to the Hankinson family is a silver shield with a red fesse, fretty gold, between three black ducks, the Crest being a demi phoenix, wings elevated gold, issuant from flames. The first recorded spelling of the family name is shown to be that of Randolph Hankynson, which was dated 1558, in the "Calendar of Pleadings to Elizabeth", during the reign of Queen Elizabeth 1, known as "Good Queen Bess", 1558 - 1603. Surnames became necessary when governments introduced personal taxation. In England this was known as Poll Tax. Throughout the centuries, surnames in every country have continued to "develop" often leading to astonishing variants of the original spelling.